- WCCW Wrestling Star Wars (October 25, '81) = Big Daddy Bundy lost, via DQ, to Chan Chung. - WCCW Wrestling Star Wars (March 15, '82) = Bundy & Gary Hart fought to a Double Disqualification with Kevin & Kerry von Erich in a "Texas Death Steel Cage" Match. - WCCW Fritz Von Erich Retirement Show (June 4, '82) = Bundy lost the WCCW American Title to Fritz von Erich in a "Falls Count Anywhere" Match. - WCCW Wrestling Star Wars (August 15, '82) = Bundy, as the NWA WCCW American Champ, fought to a Double Disqualification with Harley Race. - WCCW Christmas Star Wars (December 25, '82) = Bundy lost, via DQ, to the WCCW American Champion, Kerry von Erich. - Mid-South Superdome Extravaganza (April 16, '83) = Bundy took down Tim Horner. - WCCW Wrestling Star Wars (June 17, '83) = Bundy fell to the AJPW PWF Champ, Giant Baba. - Mid-South Superdome Extravaganza (July 16, '83) = Bundy won a "Taped Fist" Match over Dusty Rhodes. - Georgia Omni Thanksgiving Tag Team Tournament 1983 (November 24) = Bundy & Jim Neidhart beat Joe Lightfoot & Tommy Rogers, then fell to the eventual winners, Pez Whatley & Butch Reed. - Georgia National Tag Team Title Tournament (May 20, '84) = Bundy & King Konga defeated Jake Roberts & the Great Kabuki, then lost to the eventual winners, the Road Warriors. - NWA The Night of Champions (May 29, '84) = Bundy & Jimmy Valiant were beaten by the National Tag-Team Champions, the Road Warriors. - WWF WrestleMania I (March 31, '85) = Bundy defeated SD Jones. - Polynesian Hot Summer Night (August 3, '85) = Bundy, Mark Lewin & Kevin Sullivan lost, via DQ, to Andre the Giant, Angelo Mosca & Steve Collins. 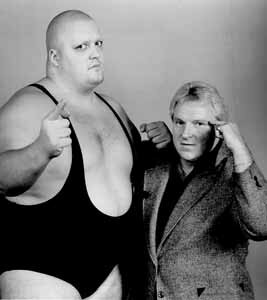 - WWF Saturday Night's Main Event #2 (October 3, '85) = Bundy & John Studd won, via DQ, over Andre the Giant & Tony Atlas. - WWF Saturday Night's Main Event #3 (October 31, '85) = Bundy & John Studd lost, via DQ, to Andre the Giant & Hulk Hogan. - WWF Saturday Night's Main Event #5 (February 15, '86) = Bundy pinned Steve Gatorwolf. - WWF WrestleMania II (April 5, '86) = Bundy lost a "Steel Cage" Match to the WWF Champion, Hulk Hogan. 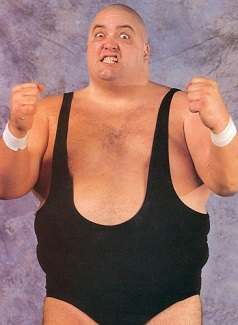 - WWF Saturday Night's Main Event #6 (May 1, '86) = Bundy defeated Uncle Elmer. - WWF Saturday Night's Main Event #10 (February 21, '87) = Bundy won, via countout, over Jake Roberts. - WWF Wrestlemania III (March 29, '87) = Bundy, Lord Littlebrook & Little Tokyo lost, via DQ, to Hillbilly Jim, Little Beaver & the Haiti Kid. - WWF Saturday Night's Main Event #12 (September 23, '87) = Bundy beat Paul Orndorff. - WWF Survivor Series '87 (November 26) = Bundy, Andre the Giant, Butch Reed, Rick Rude & the One Man Gang fought in an "Elimination" Match against Hulk Hogan, Bam Bam Bigelow, Paul Orndorff, Don Muraco & Ken Patera. Bundy was eliminated by Bigelow. Andre the Giant was the sole 'survivor'. - WWF Saturday Night's Main Event #13 (November 11, '87) = Bundy won, via countout, over the WWF World Champ, Hulk Hogan. - WWF Saturday Night's Main Event #14 (December 7, '87) = Bundy fell to the WWF Heavyweight Champ, Hulk Hogan. - ECW November To Remember '93 (November 13) = Bundy & Terry Funk were beaten by Sabu & Road Warrior Hawk. Sabu won Funk's TV Title. - Mid-South Coliseum Show (August 1, '94) = Bundy & Jeff Gaylord fell to Sid Vicious & Spike Huber. - Mid-South Coliseum Show (August 8, '94) = Bundy & Jerry Lawler lost to Sid Vicious & Spike Huber. - WWF Survivor Series '94 (November 24) = Bundy, Tatanka, Bam-Bam Bigelow & the Heavenly Bodies fought in an "Elimination" Match against Lex Luger, Adam Bomb, Mabel & the Smoking Gunns. Bundy & Bigelow were the 'survivors'. - WWF Royal Rumble '95 (January 22) = Bundy competed in the Royal Rumble, which was won by Shawn Michaels. - WWF WrestleMania XI (April 2, '95) = Bundy lost to the Undertaker. - 2nd Annual Eddie Gilbert Memorial Brawl (April 12, '97) = Bundy beat Don Montoya. - 3rd Annual Eddie Gilbert Memorial Brawl (February 28, '98) = Bundy lost to Sid Vicious. - 4th Annual Eddie Gilbert Memorial Brawl (October 2, '99) = Bundy took down Biggie Biggs. - Heroes of Wrestling (October 10, '99) = Bundy & Jim Neidhart won over Jake Roberts & Yokozuna.